Avon Lake – Mountain 2 conquered! Congratulations to the mens and womens team for this past weekend’s performance. Both teams dominated the field on their way to capturing the titles. The men had all 5 runners finish in the top 15. They were lead by Alex Phillips who won the race in a time of 16:47. He was followed by Matt Sollenberger finished in 5th; Conner McIntyer in 6th: Patrick White in 9th and Sean O’Brien in 14th place. Also worth noting was the mens team had 19 runners go 20:00 flat or better! The ladies had an even more impressive finish as they too won the title. The ladies almost swept the event! They were lead by first place winner Nina Zraik. She was followed in 2nd place by Isabella Ceepo; 3rd place by Elaina Mendiola; 5th place by Leah Lisle and 6th place with Mia Brady. All of you should enjoy the moment! This race showed great determination and desire by all of you. Now the journey gets a little more challenging. The Tiffin invite coming up will be a mini state meet. I am convinced all of you are ready for the challenge. Remember stay determined and focused. But mostly, stay POSITIVE! Enjoy this time with all your teammates. Author dlancianPosted on September 5, 2016 September 5, 2016 Leave a comment on Avon Lake – Mountain 2 conquered! Well despite the torching hot conditions the Fighting Irish were represented well at the Glen Oak Invitational. Congratulations to the Lady Irish who won the Division II-III championship on a tie-breaker over Gilmour Academy. This was a huge statement considering we were not able to beat them at all last year. The Irish were led by Isabella Ceepo, Mia Brady, Elaina Mendiola, Leah Lisle, Nina Zraik, Maddie Mellinger and Natalie Tobin . The guys team finished in 3rd place behind Tuslaw and Smithville. They were led by a strong 9th place overall finish by Alex Phillip. He was followed by Chris Flohr, Sean O’Brien, Conner McIntyre and Patrick White. Thanks to Mr. Lisle, you can see photos of the race at the link above. Author dlancianPosted on August 20, 2016 Leave a comment on THE 2016 JOURNEY BEGINS! The 2016 Fighting Irish XC team at Mohican – The journey begins! Author dlancianPosted on June 18, 2016 Leave a comment on THE JOURNEY BEGINS! Track & Field 4×200 Relay Bring Home the Gold! 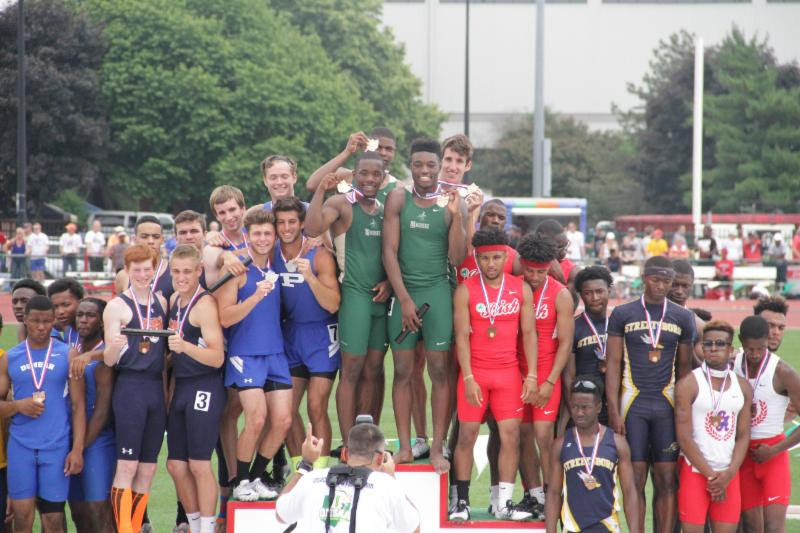 STVM brought home another State Banner in the Division II Boys 4×200 Relay. Above pictured are the members of that relay: Leonard Younger, Gonzalo Diago, Malik Wooldridge and DeAmonte’ King. STVM track and field athletes went down to Columbus on June in 2nd qualifying in 6 events. The placed on the podium in 5 of those- Goal Accomplished! Congratulations to our athletes and Head Coach, Dan Lancianese on yet another successful season. Author STVM XC TrackPosted on June 7, 2016 June 7, 2016 Leave a comment on Track & Field 4×200 Relay Bring Home the Gold!